Midfielder Yossi Benayoun has completed his move from West Ham to Liverpool. The 25-year-old, who is Israel's national captain, has signed for a reported £5m in a four-year deal. Reds boss Rafael Benitiez has described Benayoun as the ideal replacement for Luis Garcia, who joined Atletico Madrid for £4m earlier in the summer. "He said he was desperate to only join Liverpool and like Luis he is a very technical, clever player with a lot of game intelligence," said Benitez. "He can also play in many positions, giving us a different option for the team. "Maybe Luis is a player who scores more goals and Benayoun tends to make more assists. "He was offered a big new contract at West Ham and received offers from a lot of other clubs offering him more money - but Yossi's message was always the same. Benayoun, who described his Anfield move as a "dream", moved to Upton Park from Racing Santander in a £2.5m deal in 2005. And Benitez revealed he had been tracking the player since his La Liga days. "I first saw him play for Racing Santander, but when he first came to England we were watching to be sure he could adapt to a different style of football," added the Spaniard. "It's clear he's done this very well at West Ham. Liverpool fans will remember how he played in the FA Cup final against us when he was outstanding. "We thought then this was a player who is capable of stepping up to a higher level." 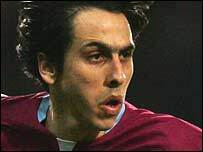 Benayoun played 72 games for the Hammers and scored eight goals. It is the second piece of business between the clubs this close season following striker Craig Bellamy's move to the capital from Merseyside in a £7.5m deal. Despite the departures of Bellamy and Garcia, Benitez has bolstered his attacking options with Benayoun following Fernando Torres and Andriy Voronin to the club and with Ryan Babel set to join.